5+ years running, Dr. Jonathan Cluett, board-certified orthopedic surgeon of Massachusetts, includes CastCoverz!, again, in his recent article “Ideas For Decorating Your Cast” on VeryWellHealth.com orthopedic expert section. Sure enough, amongst a list of fabulous suggestions, such as choosing from a variety of colorful tape or having your friends sign your trophy arm, CastCoverz! 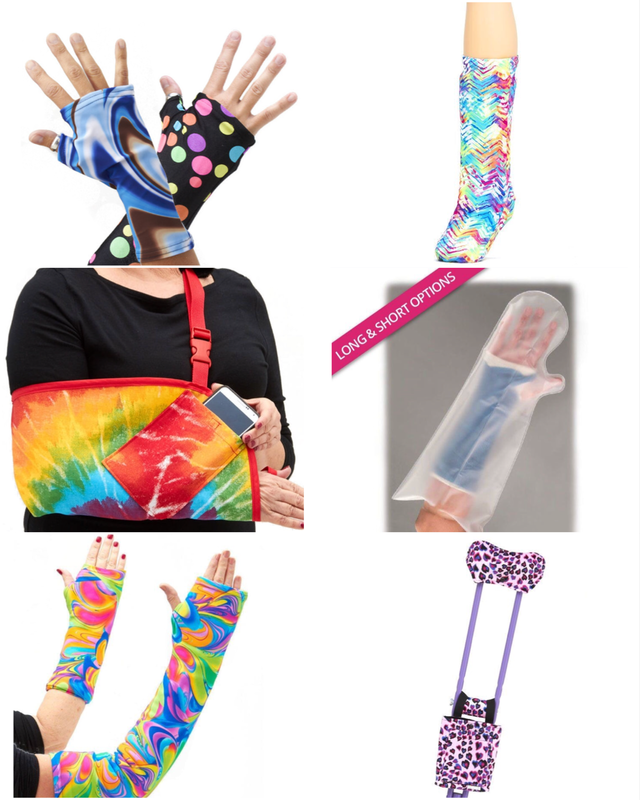 makes the TOP list for trendy & FUNctional cast covers. Fashion is certainly something we offer, however, the purpose of our products stretches far beyond the colorful trends. Unfortunately, orthopedic casts are often made from plaster or fiberglass, leaving behind lots of snags & scratches, as they protect your healing bones. CastCoverz! slip right over your boot, brace or cast to prevent this from happening! Our covers keep your boot, brace or cast clean, and can be removed & washed before your next wear. We also offer designer slings, leg, and waterproof covers for bathing or swimming, too! While colors & signatures are FUN ideas for decorating your cast, these options are permanent in the world of casts. CastCoverz! products allow you to match your mood and change your look easily for any occasion. Choose from dozens of designer fabrics, colors from discreet solids to watch-for-me neon, and fun prints so that your cast closet stays FRESH. Equally as important, CastCoverz! work to protect clothes, sheets, furniture, car upholstery and other people (of the family Fido) from being scratched! As always, we are thankful for resources like https://www.verywellhealth.com for providing daily health tips & insight from medical professionals. We believe that anything that helps you Feel Better will help you Heal Better, even if it’s a sound word of advice! For more of Dr. Cluett’s orthopedic gems, check his post here. CastCoverz! your one-stop orthopedic shop! VeryWellHealth.com is a stand-alone health and wellness brand of media giant IAC, the parent company of dotdash.com (formerly about.com). Here are four tips to help ease your panic of having an injury of how to survive the holidays with an injured arm. Help is all around, just ask for it! Do you have children at home, a neighborhood friend, or a niece/nephew? Kids LOVE to help make cookies, decorate, and wrap presents. Not only will you get added quality time, but you will be able to brag to family and friends that you had a special little elf’s assistance this year. They will be proud to have helped. No littles around? Have family and friend assist instead. No task is too small to ask for help with. When friends, family, or church members offer help; take them up on the offer. In a pinch? Use bags to wrap your gifts and skip the baking. Do you really need to have all your decorations out this year? Your family and friends will understand your limitations and will be accepting of this. This leads us on to our next tip. You may want to try to do everything you normally do, but you need to know your limits to avoid further injury and to get the rest you need heal. Need to go shopping? You are going to need someone to carry your gifts, assist you with transportation, even tying your shoes to go out. Try online shopping this year to avoid the shopping malls and crowds. Doing this with one arm is tough though right? Try snuggling up with a loved one next to a computer. Have them take over control of the keyboard while you sit back and work your way through that shopping list. Cleaning to do before your guests arrive? Take your time when doing chores around the house and do not over do it. Check out our blog on HOW TO DO HOUSEHOLD CHORES WHILE INJURED for more great tips on this topic. Cut back on the cooking. Be realistic. Do you really need to make 3 different types of fudge and 7 kinds of cookies this year? Your main priority right now is taking care of you. We suggest teaching someone your favorite recipe (what fun!) or let others bring you the sweets and treats. Have a recipe no one else can master? Take a look at our post on COOKING WHILE INJURED to help you on your way. Remember that you do not have to and at this point cannot do it all. It is important that you get some rest, especially if you are having difficulty sleeping at night. Even if it just relaxing on the couch watching your favorite Christmas movie, it is so important to your healing process. You will still want to enjoy time with family and friends and don’t let the cold weather and your injured arm stop you from holiday activities. 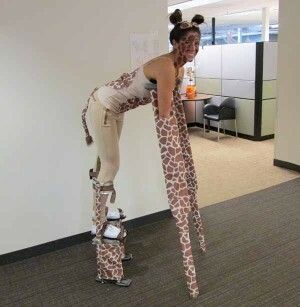 Have parties to go to where you’ll want to hide that unsightly cast? Black and sparkly, Armz! in Bling it on Black (shown here in Long and Short versions) or any of our other blingy selections will change the conversation from, “What happened to you?” to “How Cool is that? !” Check out our CastCoverz! Armz! our flagship product that will protect your clothes, furniture, and skin from snags and scratches, plus it will keep your cast clean. 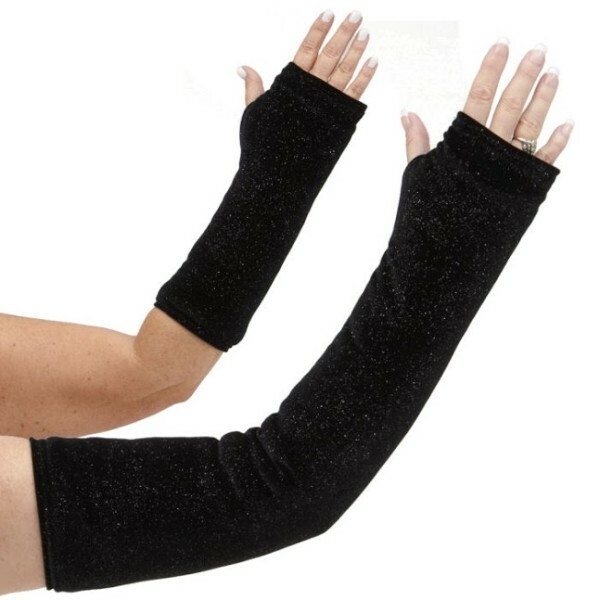 Going outside and want to keep your cast dry and your hand warm? Try Mittz! Cozy and Mittz! Dry. Looking for more helpful hints on how to enjoy the holiday season while you heal? 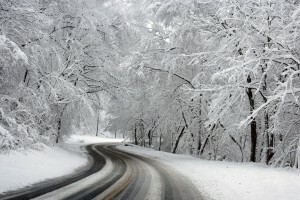 Check out Activities You Can Do In the Snow While Injured, and How to Shovel Snow When Wearing A Boot, Cast, Brace, or While On Crutches, With these tips, you will not only survive holiday season, but also enjoy it. 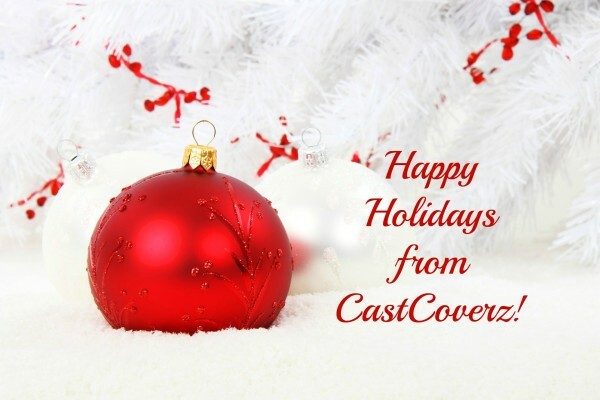 From all of us at CastCoverz! we are wishing you and yours an amazing holiday season!